n/a · Nóta “Killygarvan is originally Cill Gharbháin 'the church of Garbhán.' There are eight saints of the name Garbhán listed in the martyrologies. One of them is commemorated in the Martyrology of Tallaght on 9 July: Garbán sac. Cinn tSaile (Garbhán a priest of Ceann Sáile). 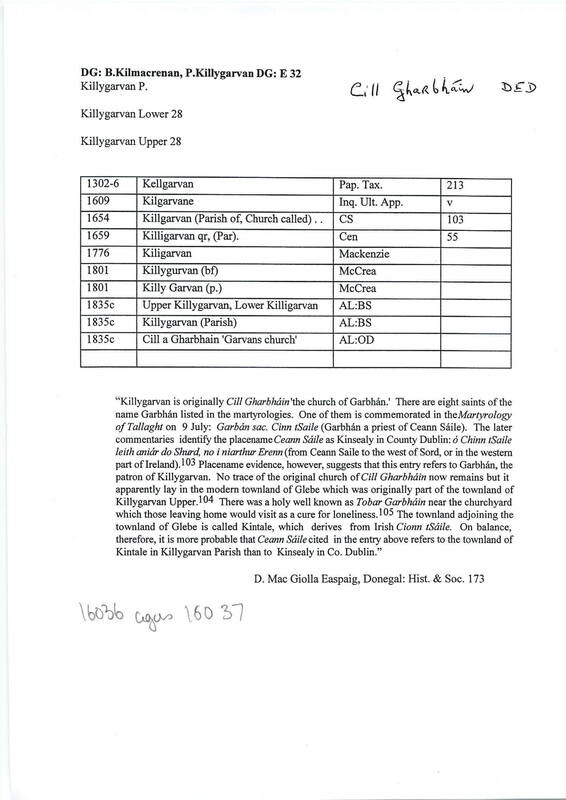 The later commentaries identify the placename Ceann Sáile as Kinsealy in County Dublin: ó Chinn tSaile leith aniár do Shurd, no i niarthur Erenn (from Ceann Saile to the west of Sord, or in the western part of Ireland).103 Placename evidence, however, suggests that this entry refers to Garbhán, the patron of Killygarvan. No trace of the original church of Cill Gharbháin now remains but it apparently lay in the modern townland of Glebe which was originally part of the townland of Killygarvan Upper.104 There was a holy well known as Tobar Garbháin near the churchyard which those leaving home would visit as a cure for loneliness. Killgarvan (Parish of, Church called) . .